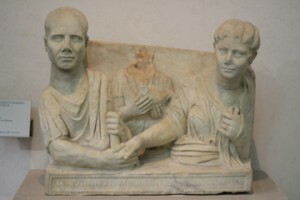 Roman Marriage: a typical depiction. The paterfamilias was a term attributed to the head of the familia in the Roman world. This position was not held by any father. Rather, among the males of a familia, the father who was at the ‘top’ of the family tree held this position. He had an exuberant amount of control over the familia, which included the execution of harsh discipline, decision making power for members of the familia, etc. Similarly, husbands (whether the paterfamilias or not) carried a great amount of authority. Wives were often given little respect (as we understand it today) and sometimes shared a status near that of their children. Given this structure, it is easy to see how a poorly tempered husband might become abusive. An abusive husband would not be held accountable for harsh behavior. In his world, such severity in action was his prerogative. As one classicist notes: “Battered wives had no legal recourse and could only hope for the intervention of their families” (Shelton, 47). * Imagine now the life of a Christian wife married to an unbelieving husband. She has chosen to live a life contrary to the chosen religious convictions of the husband (and likely the paterfamilias). This would be judged as offensive. What is a Christian wife to do? In 1 Peter 3:1-6, Peter discusses matters relating to the behavior of wives. It is essential to recognize the context in which this passage appears. In 2:11-12, Peter has applied the metaphor of ‘aliens’ and ‘strangers’ once again to his audience (cf. 1 Peter 1:1, 17). He exhorts them to “keep their behavior excellent among the nations” in order that God might be glorified “in the day of visitation.” In the greater context of 1 Peter, this is most likely a reference to the potential that some of these unbelivers will be saved and glorify God when Christ returns in judgment. In this passage, wives are called to be submissive to their husbands, even if the husband is disobedient to the word (likely the Gospel, implying he is an unbeliever). Adorned with a ‘gentle and quiet spirit’, the wife is to attempt to win the husband by ‘chaste’ and ‘respectful’ behavior (not by words). What makes this passage even more difficult to understand is the immediate context: slaves submitting to crooked masters and Jesus Christ submitting to the ultimate injustice. To what extent does Peter expect a wife to sacrifice in an effort to win her husband (keeping in mind the first century context)? In any case, I think it is important to recognize the lead up to 3:8-9 and the principle of non-retaliation. Christians who are mistreated on account of their faith (whether by civil authorities, slave-masters, or husbands) are to refrain from retaliation according to Peter. This is true for two primary reasons in the larger context: (1) Our earthly life is temporary (we are strangers passing through—our inheritance is in heaven, our lasting home—cf. 1:1, 3-9, 17-19, 23; 5:4, 6, 10); (2) Patiently enduring mistreatment might lead to the salvation of others, including unbelieving spouses (2:12; 3:1, 15-16). The implications here are extreme, especially in the context of Peter’s audience. We’ve focused here on a kind of unbelieving husband a Christian wife might deal with in the first century. Now I want to be clear: I am not suggesting that spousal abuse in a marriage (or abuse in any one of the other relationships described here) should be ignored. Such behavior is obviously wrong! The passage does not justify abuse by any authority. Peter focuses on a particular response of a Christian in these situations. Enduring the mistreatment is not giving in, being weak, or denying reality. Rather, enduring mistreatment is an intentional decision by a believer to sacrifice temporary well-being for the sake of others, to be a witness of “the hope that is in you” (3:15), a hope of unfading inheritance (1:4). After all, Peter affirms that believers have a “Shepherd and Guardian” of their souls (2:25), a “faithful Creator” to whom they should “entrust their souls” (4:19), just as a suffering Christ “kept entrusting Himself to Him who judges righteously” (2:23). *Shelton, Jo-Ann. As the romans Did: A Sourcebook in Roman Social History. New York: Oxford University Press, 1998. I don’t have your email (can’t find it on your site). I’ll use this to pass along a message. I am collecting the blog addresses of MBTS students. If you have any MBTS friends blogging, please pass along the link to the MBTS Blog page. I guess I’m confused. So what are you saying to those within an abusive marriage? (1) Abuse is wrong and never justified in the Scriptures! (2) In 1 Peter 3, there is indication that some of these woman were being frightened in the context of their marriage (3:6), though we’re not given details about what might be causing this fear. These women (along with any wife in the audience) were to be submissive in an effort win their husbands (in the case of an unbelieving husband), just as Christians in other situations were to be submissive (citizens, slaves, etc.). This included mistreatment (esp. 2:18, 20; 21-25). (3) One caveat: the civilian, slave, and wife had no legal recourse in the first century. They had no exit in the world. Thus, Peter advises them to selflessly follow Christ’s example, submit to governing authorities (perhaps Nero at the time! ), and give Gospel witness. Today, many women in the world do have legal recourse and live in societies which condemn and punish abusive behavior. So what might I say to those within an abusive marriage? (1) You must trust God above all. He is the one who judges righteously and He is a faithful Creator (1 Pet 3:23; 4:19). No matter what happens, He is the Shepherd and Guardian of your soul (3:25). (2) In any case, ask God to help your actions exemplify Christ and provide witness to the Gospel of Christ as you deal with your husband. This is the priority. (3) Seek out other believers to walk you through the situation. (4) If his behavior is potentially lethal and/or illegal, you should seek legal recourse out of submission to the law. I think the most controversial point I have outlined is the priority of Gospel-witness, even above self-protection. The NT gives numerous examples of those who endure hardship for the sake of the Gospel (such as Jesus, Paul, the disciples, Timothy) and those who are called to do so (in nearly every book of the NT).